These seem quite popular so I’ll keep scanning em in. Dunno if I’m imagining it but seem to think Simon Price was somehow in the video for Whale’s – Hobo Humpin Slobo Babe. And Cypress Hill – Insane in the Brain reminds me of living at 98 Wells St, Hackney. It got turned into an off-licence; which all of us that lived there thought fittingly appropriate. 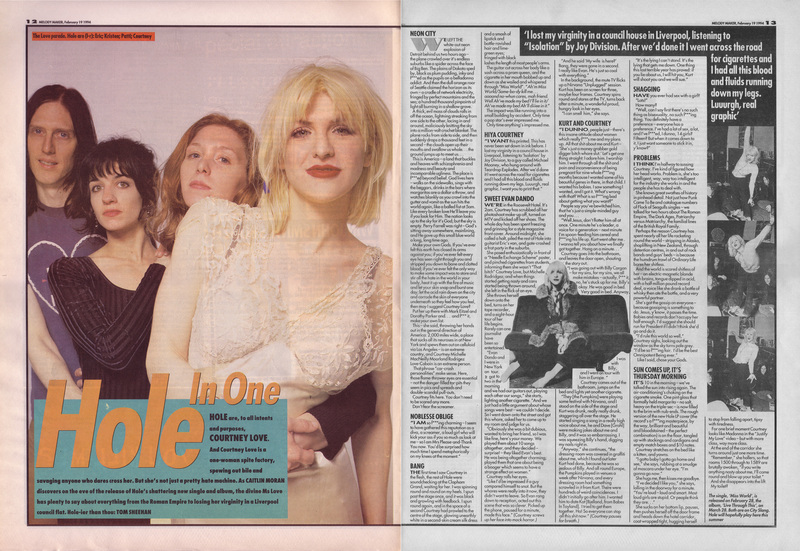 Caitlin Moran interviews Hole, 19th February 1994. Photos by Tom Sheehan. Michael Mooney, where are you now? Courtney Love on the cover of Melody Maker, 19th February 1994. Photo by Tom Sheehan. “One thing this last terrible year has proved: if you lie about us, I will hit you, Kurt will shoot you and we will sue”. But not if he shoots himself first eh Courtney? Readers, are you the sort of person that posts Jady Goody RIP messages to your friends Facebook account? Then this is the column for you! I’m going to use this Mr. 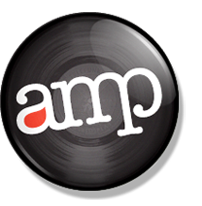 Agreeable post to just say a reciprocal hello and thanks to some of the folks who’ve linked to AMP recently. 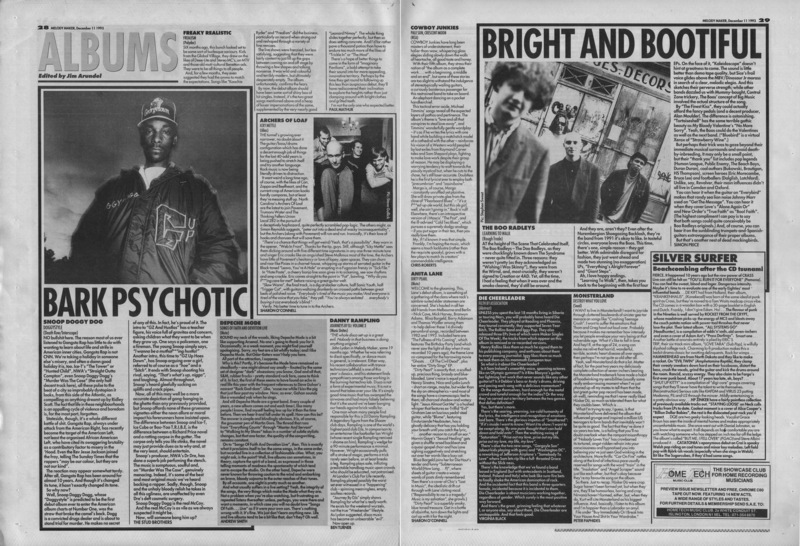 Firstly I meant to highlight the Cactus Mouth Informer blog to you all a while ago, where you can find scans from Zig Zag and Record Mirror from the years preceeding this blog, along with mp3’s and socialist musings. 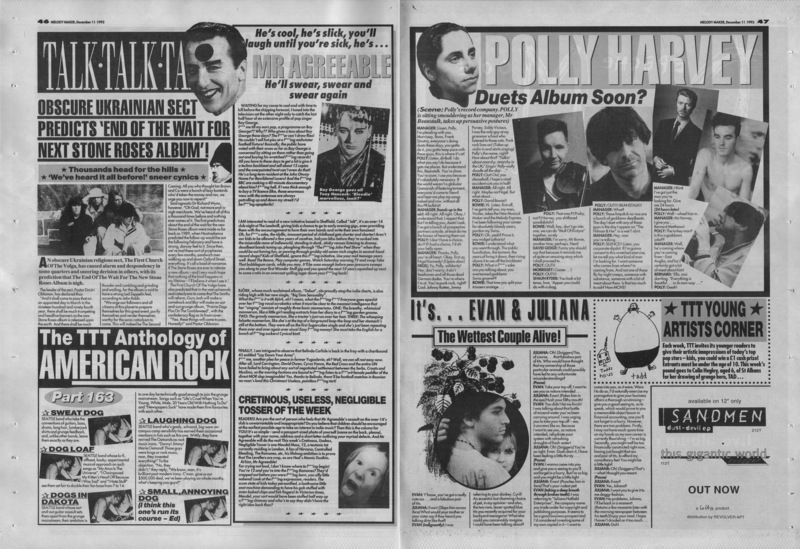 I know Simon Reynolds specifically mentioned his desire to see scans from Zig Zag to me in an email so hope highlighting it here and adding it to the related blog links helps others too. Also, Look At This, a good blog aggregating lots of interesting links and there’s more like this but with extra German over at Nerdcore. Finally cheers to ex XFM DJ Iain Baker and his Westway blog. 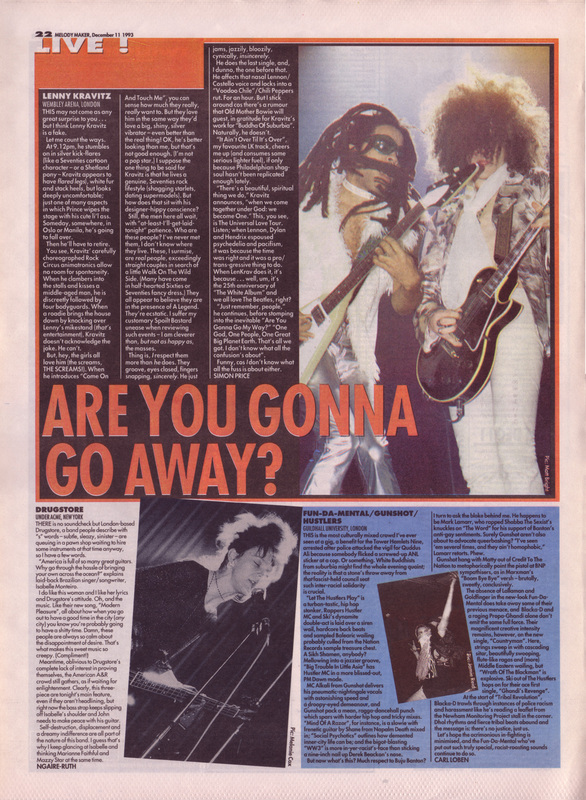 Simon Price reviews Lenny Kravitz live at Wembley Arena, 11th December 1993. Photo by Matt Bright. Completely with Pricey on this one but then what sort of right thinking person wouldn’t be? There are plenty of artists I don’t “get” but I do at least understand why they exist and can see why they have a large following. But Kravitz…Kravitz is so utterly bland, so completely detached and unemotional I just can’t fathom what he does to connect with so many people. From memory the first time I was made aware of Lenny was Let Love Rule, video was all hippy dippy lens flares (in both senses) and then he was shagging Lisa Bonnet and then he had a pub rock anthem with Are you gonna go my way? before actually going away, at least for me, just as the witty title of this piece begs him to do. 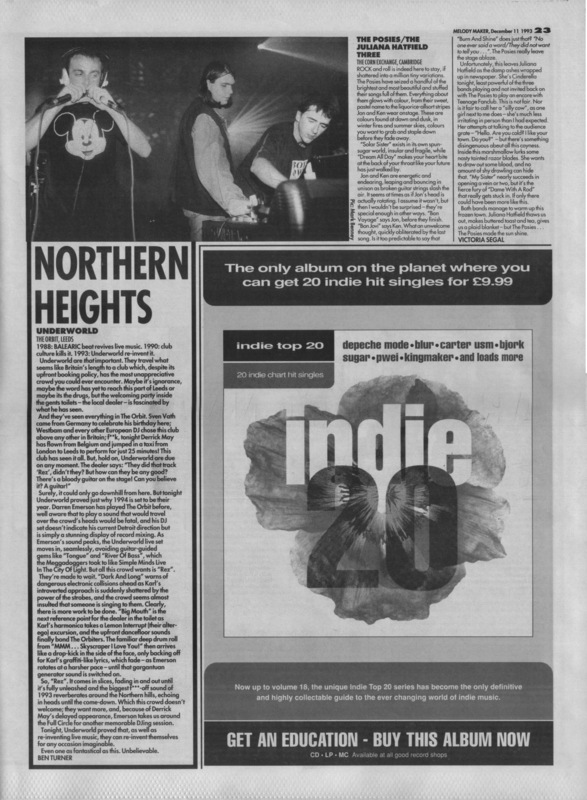 Many thanks to Johnny2000 at http://linkfilter.net for spreading the Archived Music Press word.